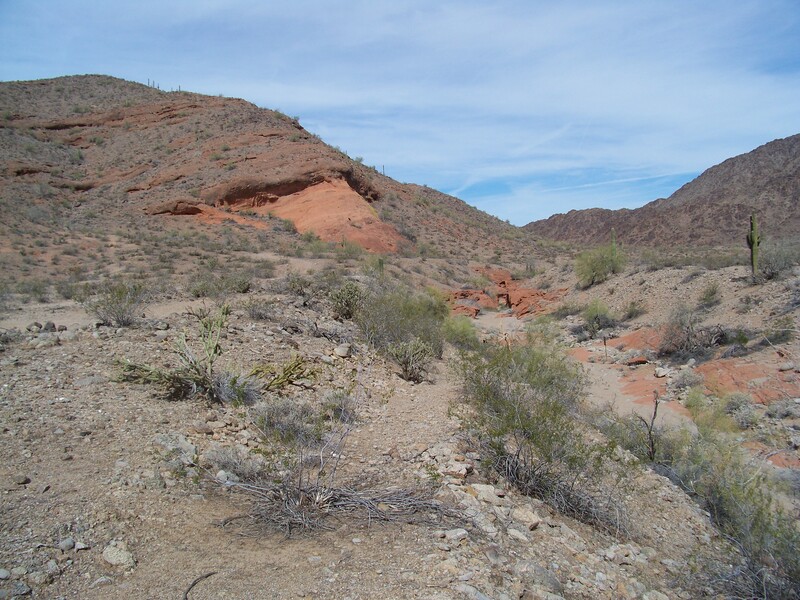 The arkosic sandstone outcrop and arroyo known locally as Red Rock Canyon can be seen for miles. The Patayan glyphs are located in three slot canyons below the large sandstone outcrop seen here. Photo by Roy Pierpoint. Long time avocational archaeologists Roy and Ella Pierpoint will lead a two day tour of the less well-known and accessible sites in the Gila Bend area. Saturday we will tour the Red Rock Canyon glyphs and rock shelter, the Gillespie Dam petroglyphs, the Spring Mountain geoglyphs, and ballcourts and compound on the Enterprise Ranch. Sunday will hike into the Pierpoint site, a walled-village with more rock art. We will meet on Saturday morning at 10 am at the Pierpoint’s farm 10 miles north of Gila Bend. Self-contained campers are welcome to stay on the farm. We will leave just after lunch on Sunday. Registration is limited to 20 people. To register email Katherine Cerino.